Google Webmaster Search Console will help you to manage Google's indexing of your site. Yola has made it possible for you to take advantage of Google Webmaster's website optimisation tools. 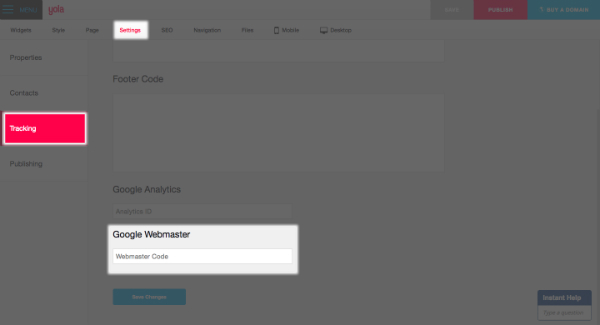 In this tutorial, we will give you step-by-step instructions on how to verify your site and submit a Sitemap to Google Webmaster Tools. If your site is not yet published to the web, you will have to do so first, because you will need the URL (web address) during the verification process. If you have not published your site yet, please follow the steps in this tutorial : Publishing Your Site. If you plan on purchasing a custom domain to publish to before getting found on Google, now would be the perfect opportunity. Once your site is published, you will see the URL by going to Settings > Publishing. Under "Your Domain(s)", you should see the domain URL for your site listed beside Primary Domain. 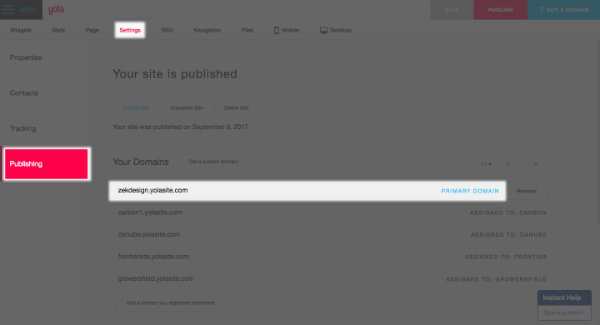 Write down the URL - in our example, it is http://zekdesigns.yolasite.com - and head on over to Google Webmaster Tools to get started. If you do not have a Google account, you will have to create one, otherwise sign in with your Google login details by clicking Sign into Search Console. If you are signing up for Google Webmaster for the first time, on the Webmaster Tools homepage, you will see a welcome message and below it, a box to add your site's URL. Paste or type the URL into the box and click on Add A Property. 1. Click on the Alternate methods tab. 3. Copy the portion of the tag next to content, between the quotation marks. In our example, the section to copy is vDEFASlzekmknyZVwJK82Ecty45wNGsUGMl1ErEJ1K4. 2. Then go to Settings > Tracking. 3. In the Google Webmaster field box, paste the verification code into the space provided. 5. In the Sitebuilder, click Publish. D. Once you have added your code to Yola, go back to Webmaster Tools. Click the Verify button at the bottom of the page. If you have verified your site correctly, you will see the message "Congratulations, you have successfully verified your ownership…." Click the Continue link underneath the message. This will take you to the Site Dashboard page. When you publish your site, Yola generates a Sitemap for the site. This is not something you will notice when your site is published, because it happens behind the scenes. You can submit your Sitemap to Google, using Google Webmaster Tools. Doing this, will give Google more information about your site. If you want to find out more about Sitemaps and why these are useful to Google, please see About Sitemaps. The Sitemap for your published site, is the site's URL (web address), followed by /sitemap.xml. In our example, the Sitemap will be : http://zekdesigns.yolasite.com/sitemap.xml. 1. Log into your Google Webmaster Tools account. 2. Make sure you are on the Site Dashboard page. 4. Click Add/Test Sitemap. A screen will open up, with the name of the selected site, enter sitemap.xml in the space provided. 5. Click Submit Sitemap. You will see a Sitemap submitted message. Google Webmaster's Help page is packed with information. Here is the link: Google Webmaster Help.